Dan Devine played QB at the University Of Minnesota-Duluth on the GI Bill, was married while in school, immediately had children, and juggled three varsity sports and three jobs in order to support his family. This set of responsibilities he later stated, taught him the organizing skills needed to become a successful head coach. His first coaching job at small East Jordan, Michigan H.S. where the squad had gone winless in 1947, resulted in a 16-0 record for the 1948 and ’49 seasons. When Michigan State head coach Biggie Munn and assistant Duffy Daugherty were visiting the resort town, Devine impressed them and they hired him as a graduate assistant at half of his high school salary. He was a tireless assistant as his family grew to one son and six daughters and he proved he could run his own team as Daugherty, who had succeeded Munn as head coach, gave him free reign in directing the Spartan freshmen team. He came highly recommended for the Arizona State job but few could have predicted how unbelievably successful Devine would be. Joining Devine was his new line coach, twenty-eight year old Frank Kush, a former 175-pound First Team All American guard for the Spartans. Devine and Kush re-shaped the Devils into an 8-2 contingent and all of the players adopted their head coach’s eye for detail. A self-professed “fussbudget”, Devine insisted that jerseys be tucked in, football shoes be shined, and players both looked and acted the part of respectable Sun Devil football players who attended class and church regularly. Certainly, the team looked sharp in their upgraded uniforms, with the helmet now a sunflower gold with a one-inch maroon center stripe. Devine placed one-inch gold with black trim “Eagles style” numerals on the back of the shell for easier player identification. Future CFL player John Jankans, the only Arizona State player to be named first team All Conference for four years, led the way for experienced QB Dave Graybill, HB Bobby Mulgado, and HB Leon Burton who gained 243 yards in only six carries against Hardin-Simmons. Burton, a former All State back out of Flint, Michigan whom Devine was able to woo away from his former staff at Michigan State, was a high school track and football standout who had set State Of Michigan records in the low hurdles and 60- Yard Dash. He would very much change the face of ASU football in the next few seasons and began by being named Conference Freshman Player Of The Year and All Border Conference. Burton put up 694 rushing yards for an incredible 10.2 yards-per-carry average. The 7-6 loss to Arizona took some of the joy out of the otherwise terrific 8-2-1 year but the team was rewarded with a post-season trip to play at Hawaii, Graybill was the Border Conference MVP, and Devine was named College Coach Of The Year. 1956 was even better than Devine’s debut season, beating the rival Wildcats 20-0 and losing only to Texas Western in finishing 9-1. The loss placed them second in the Border Conference to Texas Western and there was no bowl invitation due to ASU's isolation and lack of media coverage. With Burton missing time due to injury, HB Bobby Mulgado shouldered the load and ran and caught for enough yardage to place sixteenth nationally in total yardage accumulation. End Clancy Osborne and guard Ken Kerr did the grunt work up front with Osborne doubling as a fine defensive player. QB Dave Graybill finished on the gridiron but would remain in ASU’s athletic annals as a starter in football, basketball, and baseball. Graybill topped off his collegiate career by winning the National Singles Handball Championship. Even without the bowl bid following a great ’56 season, there was plenty of enthusiasm for 1957 and Devine was up to the task of elevating ASU’s profile. This Sun Devils team earned their place in Tempe history, undefeated at 10-0, burying Arizona 47-7 behind Burton's four TD's, and finishing number 12 in the AP Poll. Great line play led by Bert Jankans, the younger brother of the graduated John Jankans, and end Clancy Osborne who became one of the expansion Minnesota Vikings early luminaries after a few seasons at LB with San Francisco, Mulgado's clutch rushing and receiving, and Burton's gaudy NCAA record of 9.26 yards per carry as the nation's leading rusher and scorer had everyone delirious. 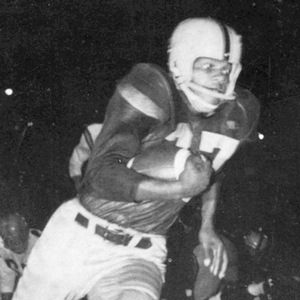 Burton finished a distinguished collegiate football and track career, played in the CFL for a year and then led the AFL in kickoff returns with a 28.4 yard average for the 1960 Titans. After playing another season with the New York team, he completed his pro career with the Grand Rapid Jets of the United Football League. The air left the balloon when Devine was informed that due to the strength of schedule and lack of name-recognition, there would be no bowl bid for this great team either. Despite the winning record and influx of talented players like Burton who was the NCAA rushing leader and Mulgado who led the nation in punt returns, the bowl rejection was the final straw for the highly-sought Devine and he announced he was taking the head job at Missouri. Devine went on to great success at Missouri, the Green Bay Packers, and Notre Dame University, earning entry to The College Football Hall Of Fame for his coaching prowess. However, intending to take his staff with him, even Devine was a bit apprehensive for the Sun Devils' future as young Frank Kush decided to accept the head coaching job and remain in Tempe.